It started when one of our conference sponsors, Zurich Financial Services, wanted to do something meaningful in South Africa and give the delegates a wider sense of our location. Our conference venue, Spier Hotel, is a participating member of the Pack for a Purpose program. They were able to supply lists of uniform and stationery requirements for Lynedoch and Vlottenburg, which serve impoverished communities nearby. The supplies assisted six and seven year old students to start Grade 1. Ausure conference delegates went shopping for the items in Australia and then each gave up approximately 2.2 kilos of space in their luggage to bring the items to South Africa. In addition to school packs, two Lumley Insurance delegates hauled over 50 soccer and 50 rugby balls to South Africa to give to the children. Pinnacle Insurance Services also gave 10 soccer balls. Collectively, this enabled more than 260 kilos of supplies to be delivered. Getting people to actively participate in shopping for a child and transporting items, rather than just donating money, made the experience even more meaningful for conference attendees. The reaction of the children to receiving these packs and balls was incredible. They were so excited and so grateful. And when Lynedoch’s principle Grantham Jansen got up to speak in appreciation there wasn’t a dry eye in the room. Pack for a Purpose was a catalyst for the David Paul Foundation, initiated by Ausure’s Chairman Wayne Brown to assist with the development of sporting opportunities for students of Lynedoch Primary School in South Africa. 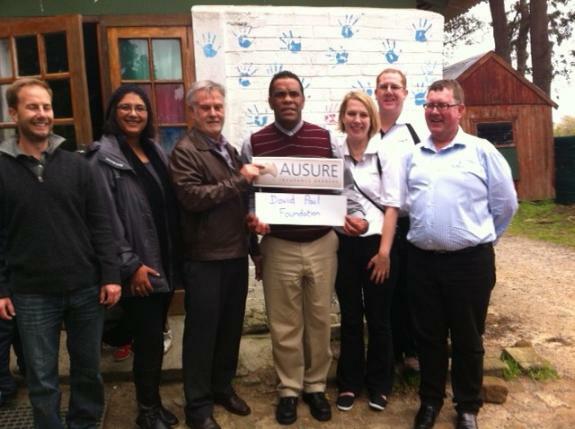 The Ausure/Zurich Pack for a Purpose donation is brought to life in this article published in Australia’s Insurance News Magazine, Dec 2013/Jan 2014 issue. Thanks to Rebecca Rothney and her team of talented and dedicated volunteers for setting up Pack for a Purpose. It is a wonderful project and we can’t recommend Pack for a Purpose highly enough, especially for other companies to get involved. Making a difference together is powerful.